The Jodrell Bank Discovery Centre has a broad remit of enhancing public engagement with our research, combined with providing out-of-classroom education aimed at inspiring the next generation of scientists and engineers. The unique mechanical orrery (a moving model of the Solar System) in the Planet Pavilion. The Discovery Centre is home to the iconic Lovell Telescope, built in 1957 by Sir Bernard Lovell, the world's first fully steerable radio telescope which pioneered developments in radio astronomy. Current exhibits highlight the centre's research, including the work of the Lovell Telescope, pulsars, e-MERLIN, the CMB, black holes, gravitational lensing, stars, and the search for life. Researchers at Jodrell Bank Centre for Astrophysics work closely with the Discovery Centre in sessions such as the daily Meet an Astronomer during school holidays, and in the series of public Lovell Lectures which are held quarterly. Facilities include the entrance building, the Planet Pavilion, a Space Pavilion for exhibitions and events, and a glass-walled café with a view of the Lovell Telescope and an outdoor dining area, an education space, and landscaping of the gardens including a Galaxy Maze. A large orrery was installed in 2013. 2014 Marketing Cheshire Annual Awards, Team of the Year. 2014 The Institute of Physics Kelvin Medal and prize: awarded jointly to our Director, Dr Teresa Anderson MBE and Professor Tim O'Brien, Associate Director of Jodrell Bank Observatory. 2014 Shortlisted for Museum and Heritage of the Year Innovations Award : For the Jodrell Bank Projections. 2012 Marketing Cheshire Annual Awards, Visitor Attraction of the Year. 2012 UK Festival Awards, Extra Festival Activity Award: For 'Extreme Creativity' in initiating the Live from Jodrell Bank Science Arena. 2011 Marketing Cheshire Annual Awards, Small Visitor Attraction of the Year. The Jodrell Bank Discovery Centre welcomes over 150,000 visitors each year to the famous Cheshire scientific facility, 21,000 of whom are school pupils on educational visits. A Visit to Jodrell Bank Discovery Centre with contributions from Profs Teresa Anderson and Tim O'Brien. The clockwork orrery at Jodrell Bank Discovery Centre. 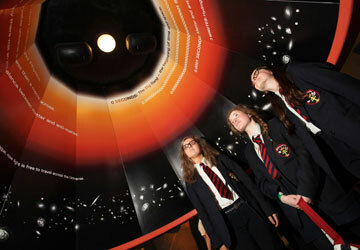 A Year 2 class from Brabyns Preparatory School visit Jodrell Bank Discovery Centre as part of their 'space' topic.